(CBS News) Would you be more likely to tell the truth if you knew your health was at stake? 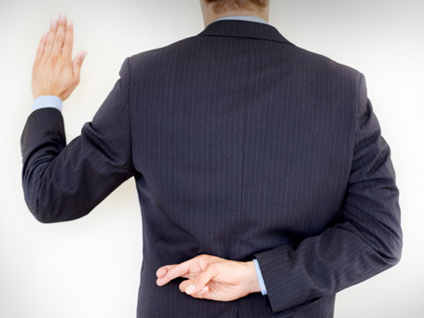 A new study suggests that liars may be unhealthier than their truthful counterparts. For the research, psychologists from the University of Notre Dame in South Bend, Ind., performed polygraph tests on 110 people over 10 weeks. The majority of participants - 66 percent - were college students and the rest were adults who lived near the university, with an average age of 31. About half of the subjects were told to stop telling major and minor lies for the 10-week study period, and other half served as controls and received no instructions. Both groups came to the lab once each week to complete questionnaires about their health and relationships and take a lie detector test to determine how many major lies or fibs they told during the previous week. Their findings were presented last week at the American Psychological Association's annual convention in Orlando Florida, and are preliminary since they've yet to be published. Throughout the study, subjects in the group instructed not to lie reported better health, the researchers found. When participants that group told three fewer white lies than they did in previous weeks, for example, they reported four fewer mental health complaints (such as stress or sadness) and about three fewer physical health complaints (like sore throats and headaches). The pattern was also seen for major lies, the researchers found. Participants in the no-lie group became more truthful over the 10-week study, the polygraphs revealed, and by the fifth week many of them saw themselves as "more honest" individuals. In weeks in which participants told fewer lies, they were more likely to report improvements in personal relationships and better social interactions. A statistical analysis by the researchers of the participants' questionnaires found that these relationship improvements significantly contributed to the overall health improvements the participants reported. "Recent evidence indicates that Americans average about 11 lies per week. We wanted to find out if living more honestly can actually cause better health," study author Dr. Anita E. Kelly, professor of psychology at the University of Notre Dame, said in a press release. "We found that the participants could purposefully and dramatically reduce their everyday lies, and that in turn was associated with significantly improved health." The participants in the no-lie group said they realized they could easily tell the truth about their daily accomplishments rather than exaggerate, and others said they learned to stop making false excuses for being late or not completing tasks. Experts agree these changes could lead to health improvements. "When you find that you don't lie, you have less stress," Dr. Linda Stroh, a professor of organizational behavior at Loyola University in Chicago who was not involved in the new study, told USA Today. "Being very conflicted adds an inordinate amount of stress to your life. Dr. Bryan Bruno, acting chairman of the department of psychiatry at Lenox Hill Hospital in New York City who was not involved in the research, added to HealthDay, "People might recognize the more devastating impact lying can have on relationships, but probably don't recognize the extent to which it can cause a lot of internal stress." WebMD offers tips for parents on how to teach kids to tell the truth at an early age.